The remains of a lunch at Cafe Jerusalem in Lviv. All photos courtesy Emma Claire Foley and Guy Tabachnik. Lviv’s historical center betrays its cosmopolitan past: there, Poles, Ukrainians, Jews, Armenians, the odd Scot, and many other groups lived together, and together built one of the prettiest and most interesting cities in Eastern Europe. In 1939, a third of the city’s population was Jewish; today, its past as a center of Jewish life is visible only in a few faded signs in Yiddish, and on Staroevreyska (Old Jewish) Street, where the ruins of the Golden Rose Synagogue stand. Next door, the restaurant Under the Golden Rose (in Ukrainian, Pid zolotoyu rozoyu) offers its patrons a cartoonish take on Galician Jewish life: the walls are decorated with menorahs and pictures of Ashkenazi Jews, the waitstaff’s black vests and long skirts hearken back to some undefined but clearly distant historical period, and the menu features chicken soup, kishkes, and Israeli wine. There are no listed prices; guests are expected to haggle over the bill. This last fact, in particular, has drawn criticism from Jewish media outlets, and makes for a cringey close to an otherwise basically tolerable meal. Although the restaurant has the blessing of Lviv’s Jewish community, Under the Golden Rose is owned by the !FEST company, which runs themed restaurants that cater to foreigners. And it’s not what we’re here to talk about, anyway. Tucked away in the basement of a brick building a tram ride from the city center is the lesser-known Cafe Jerusalem, a restaurant run by chef Lola Landa and her family. We walked in on a Saturday afternoon during a weekend of intense indulgence in the city’s many cuisines, ready for lunch. Unfortunately, it was the first weekend after Rosh Hashanah, and the place was booked for a private party. As we walked out, disappointed, we passed three women coming in. “S novym godom,” they greeted the restaurant workers: ”Happy New Year,” in Russian. We returned the next day, and it was overwhelmingly, bewilderingly good. There was forshmak, a ground herring spread, served with small, almost delicate pickles, and firm, just-pungent-enough slices of pickled herring, with brown bread and thinly sliced onions. This gave way to several glorious iterations of meat cooked with fruit, accompanied by kasha varnishkes, roasted potatoes, and couscous. The deep flavors of the dishes betrayed the hours needed to prepare each one; the meat was incredibly tender, but with a peppery brightness. The homey wallpapered dining room felt less like an attraction than like the living room of a generous, vivacious great aunt. As we paid and rushed to our train, we asked ourselves how a place this cozy, this tasty, this unassuming, yet firm in its Jewishness could possibly exist in Ukraine in 2017. A few weeks later, Landa welcomed us into the restaurant’s back room, where a long table weighted down with ingredients left just enough room for the four of us. 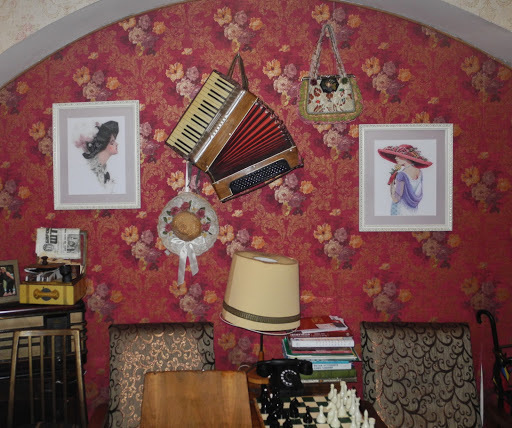 The walls were decorated with paintings and needlepoints, and a velvet couch took up one end of the room. What could have been a claustrophobic space—a windowless basement room—was positively homey, and that was the point: Landa explained that the restaurant was meant to look like the apartment her family had lived in for many decades. 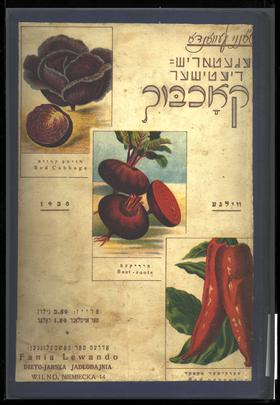 The menu for the day was forshmak (her mother’s recipe, with the herring soaked in strong black tea), gribenkes (that is, gribenes—hard-boiled eggs mixed with rendered chicken skin), tzimmes, kasha varnishkes, and eysik fleysh, a dish of veal or beef stewed with honey and stone fruits (in the style of Vinnytsia, a city in central Ukraine that is, incidentally, the home town of Volodymyr Groysman, the country’s Jewish prime minister). Landa delegated tasks, adjusted our technique, and made sure that the cooking was going smoothly as she told us about her family and how she had come to own the restaurant. Chef Lola Landa, pictured here with thematically consistent matzo phone case. Like many post-Soviet Jews, Landa isn’t religious, but she is connected to the community: she served as a madrich as a young adult and lived in Israel for a time. She also inherited her industry: her parents owned a restaurant. However, they did not cook Jewish food: theirs was a typical Ukrainian restaurant named Zbruch, after the river that served as the interwar border between Poland and Soviet Ukraine—“the border between capitalism and communism,” she explains, smiling at her parents’ sense of humor. The interest in traditional Ukrainian Jewish food was entirely Landa’s, and, as she put it, an entirely pragmatic decision: given her restaurant’s location outside the city center, she needed a way to stand out and attract visitors. The food her parents, her grandparents, and other members of her community used to make at home was as a natural solution. Talking and cooking with Landa, though, the decision to open a Galician Jewish restaurant seems like an inevitability. Before returning to the restaurant industry, she was a professor of economics, and her passion for learning, teaching, and documenting traditions is impossible not to sense as she gently instructs you on the proper way to debone a herring. Clockwise from top: David Kurkovskiy; herring. Despite the food’s richness, economy—the need to get every edible morsel from every ingredient—has exerted a decisive influence on the cuisine she is meticulously researching and preserving. When she’s not at the restaurant, Landa spends much of her time traveling around Ukraine, collecting recipes from older women and teaching cooking workshops. She tells us about a Hasidic grandmother she met who could make a broth that tasted just like chicken broth—using only matzo. Chicken, she goes on, is a foundational ingredient in so many of these recipes for just this reason: a single bird can be spread across four or five meals. A certain version of this hardheaded approach informs her own cooking. She tells us that this way of cooking has largely fallen out of style even among Ukraine’s Jews. Why? It’s “pure slow food,” she says, using the English phrase. No one has time anymore. Landa explains to us that this, too, comes from centuries of making do with very little: making cheap cuts of meat tender and tasty requires hours of slow cooking. Her words, like her work, are not first of all a gesture of mythmaking—of poor, oppressed Jews who despite it all were able to produce an amazing culinary culture—even though she is intensely aware of the history of her food and eager to share it. Indeed, like her decision to open a Jewish restaurant itself, many of Landa’s menu choices are driven at least as much by practicality as a desire to preserve a fading culture. The food is not kosher, she tells us, but “kosher-style”—the certification required to make the restaurant and all its suppliers kosher would make the prices three times higher than they are. 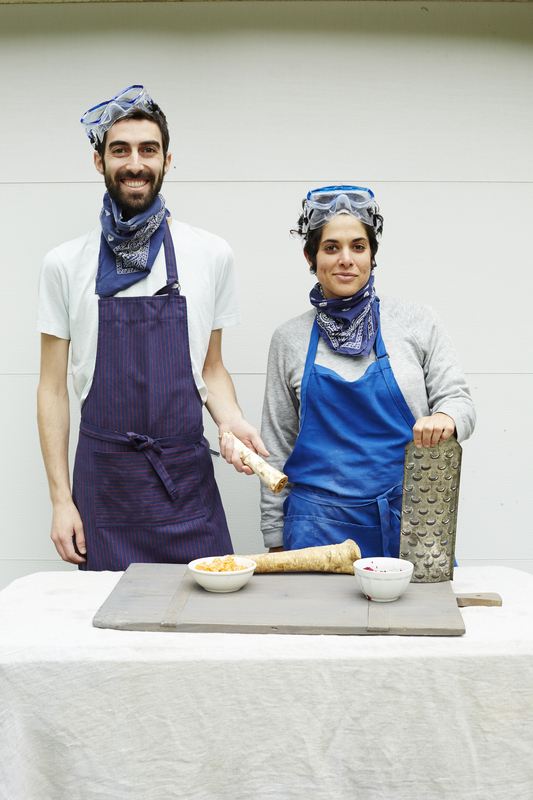 Similarly, when we ask her about the presence of dishes like falafel and hummus, she responds flippantly that it’s just business: guests expect food like that in a Jewish restaurant, so she reached back to her time living in Israel and put them on the menu. One more look at Cafe Jerusalem. This approach—respectful to Jewish traditions, but not reverential; driven by commercial considerations, but not a tourist trap—makes a meal at Cafe Jerusalem very different from the experience one gets at many other Jewish restaurants and memorials to Jewish culture in the area. Instead of preserving Eastern Europe’s Jewish past in amber and lamenting its loss, Landa places it squarely in the present and has plans for its future. Yes, Lviv’s Jewish population is a fraction of its former size, but Landa is sanguine about its chances for survival. And the future she imagines for Ukrainian Jewish food is as multicultural as the world in which it was born. Landa is one of the organizers of the Galician Cuisine Club, a group that collects and shares recipes from different food traditions in western Ukraine. At the group’s events, you are as likely to see Hutsul krepliky as Landa’s kreplach, her eysik fleysh, or the liver and apples of prominent Ukrainian food blogger Pani Stefa. As our lesson was drawing to a close, she told us that there would be a workshop on nigunim—traditional wordless Jewish melodies—followed by a concert at the local Hillel, and offered to drive us over. We gladly accepted. We arrived at the end of a cooking workshop co-led by Landa’s preteen daughter. That evening, as we talked and ate and sang in the colorful space, it was hard not to share her optimism. Landa, who is working on her first cookbook, was kind enough to let us print recipes for three of the dishes she taught us. Please note that when we sent her the recipes for proofreading, she reminded us not to skimp on pepper, and we pass this advice on to you. The night before, put meat in a bowl of water to soak overnight in the fridge. The next day, cut into roughly bite-sized cubes and carefully remove any connective tissue. Sautée onions on low heat in oil and a bit of water. Cover pan and let onions reduce to a marmelade. Periodically add water as the onions cook down so they don’t stick to the bottom. When onions are nice and brown and very soft, add carrots. When carrots are soft, add half of the honey, meat, and salt and pepper. Add just enough water to cover the meat and cook on very low heat for 2–3 hours, or more if you have the time. Add cherries and the other half of the honey, tomato paste, and lots of salt and pepper, to taste. Add water as needed to achieve desired consistency. Cook for 5–10 minutes more. Add pryanik and bread. Cook for another few minutes, then serve, preferably with varnishkes (see below). Cook pasta and buckwheat separately in boiling water until soft. Sautée pasta in oil or schmaltz on medium heat until a bit crunchy. Add buckwheat and sautée until everything is nice and crunchy. Best served, of course, with eysik fleysh. Add carrots, raisins, and salt and pepper to taste, and cook until water evaporates somewhat. Add honey and cook until carrots are soft. A soft Russian ginger cookie made with honey. If you can, get them at your local Russian grocery store. They look like this. If you want to take a crack at making them yourself, you can try this recipe. Otherwise, ginger snaps will probably do fine. Russian and Ukrainian black bread is very dark and very dense. Again, if you can’t find the real stuff, just go for the darkest rye bread you can find. Tabachnick, Guy, and Emma Claire Foley. “Long Lunches at Cafe Jerusalem.” In geveb, March 2018: https://ingeveb.org/blog/long-lunches-at-cafe-jerusalem. Tabachnick, Guy, and Emma Claire Foley. “Long Lunches at Cafe Jerusalem.” In geveb (March 2018): Accessed Apr 22, 2019. 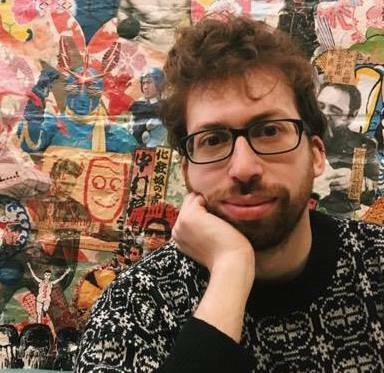 Guy Tabachnick is a translator and soon-to-be PhD student in linguistics interested in the culinary customs of Central and Eastern Europe. He has assisted in pig slaughter festivals in Slovakia and was briefly a minor elected official in the Czech Young Greens. He no longer lives in Prague. 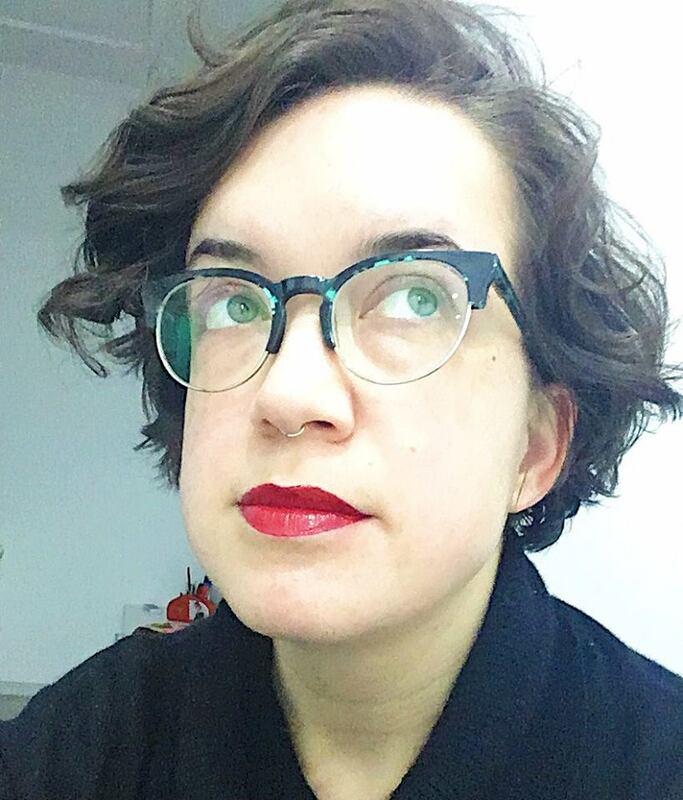 Emma Claire Foley is a writer and researcher living in Washington, D.C. She has lived and traveled extensively in Yiddishland, and when pressed can produce a very Slavic-heavy conversational Yiddish. Her writing and other cultural production can be found at emmaclairefoley.com.